Background: Self efficacy can optimize the quality of life of clients who undergo the healing process due to chronic diseases. Individuals with higher self-efficacy move their personal and social resources proactively to maintain and improve the quality and length of their lives so that they experience a better quality of life. Objectives: the purpose of this study was to find the correlation between self efficacy and quality of life of patients with chronic kidney disease who undergo hemodialysis at RSUD Semarang Regency. Metode: This type of research was descriptive correlation with cross sectional approach. The samples in this study more 76 people with total sampling technique. The data collection tool for self efficacy was measured by General Self-Efficacy scale, for quality of life with WHOQoL-BREF. Statistical test used Kolmogorov-smirnov. Result: The result showed that self efficacy in patients with chronic kidney disease was mostly in moderate category (53,9%), quality of life in patients with chronic kidney disease was mostly in good category (68,4%). 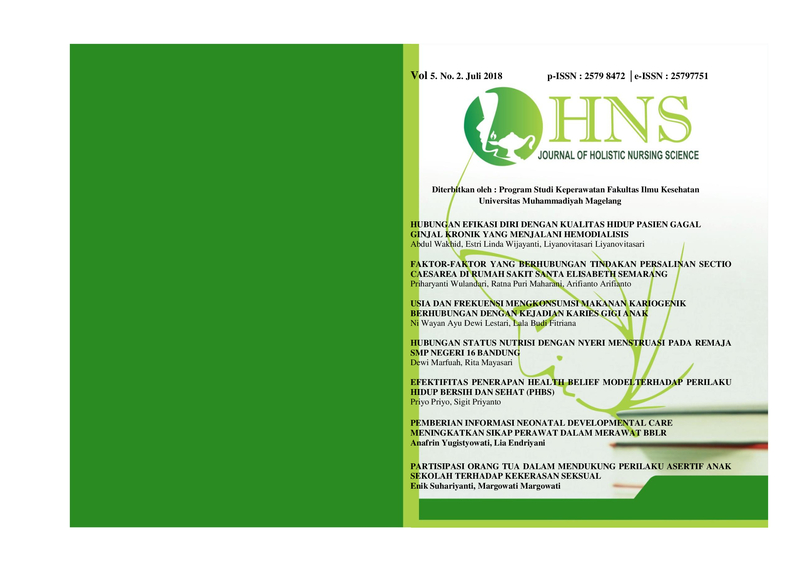 There was a correlation between self efficacy and quality of life of patients with chronic kidney disease who undergo hemodialysis at RSUD Semarang Regency, the result obtained p-value of 0.000 <α (0,05). Suggestion: Patients with chronic kidney disease can maintain good quality of life by helping to generate positive self-esteem and high self efficacy.